Ashley Leither is a wife, mom of 3 girls, chocolate lover and yarn addict. She learned to crochet in 2012 and hasn't stopped since. 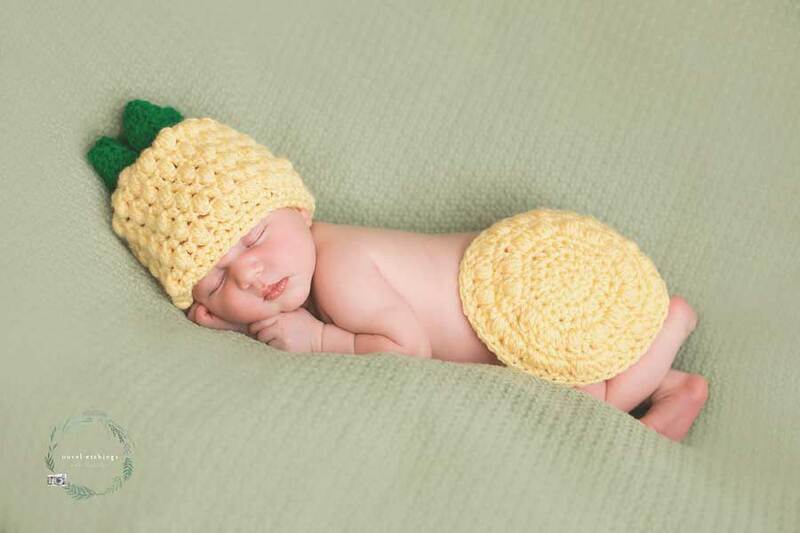 Her biggest passion is crocheting anything with a gorgeous texture! My name is Ashley Leither, I am the crochet designer behind Ashley Leither Designs. 6 years ago, I was a stay at home mom to 2 little girls and I was looking for a craft that I could do while my girls played but I also wanted a craft that was safe for them if they got into it. 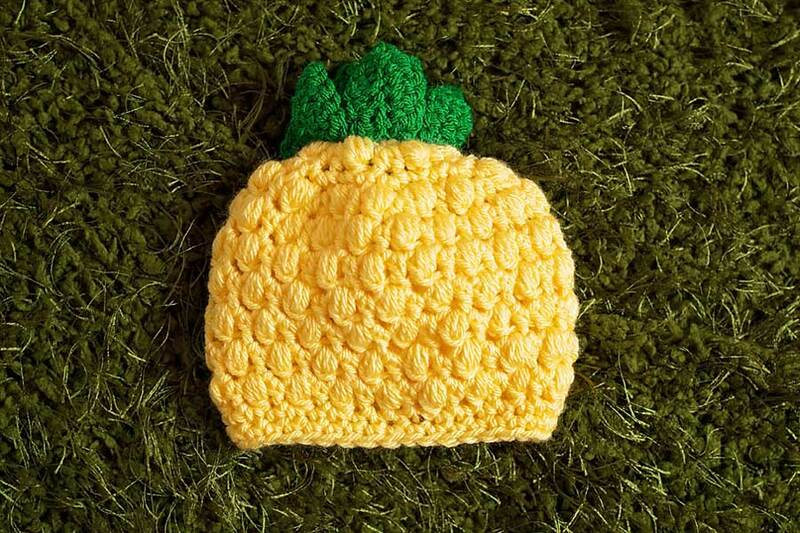 When my daughter Holley received a crochet hat from a Facebook giveaway, I fell in love with crochet, the beautiful texture of this hat was absolutely amazing! Right then I knew I needed to learn how to crochet! So I did, I taught myself to crochet from the help of learn to crochet books and YouTube videos and I haven't stopped since. 6 years and 3 little girls later, I am still amazed by crochet texture and it is my ultimate favorite to design with! Since then I have designed over 250 patterns, recorded tutorials, and written 2 books. 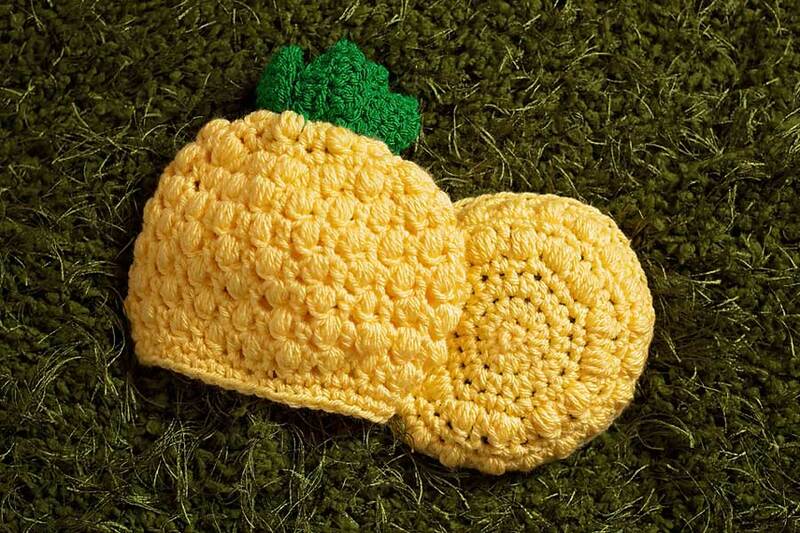 Today I want to share with you this fun Pineapple Baby Pattern just in time for summer! 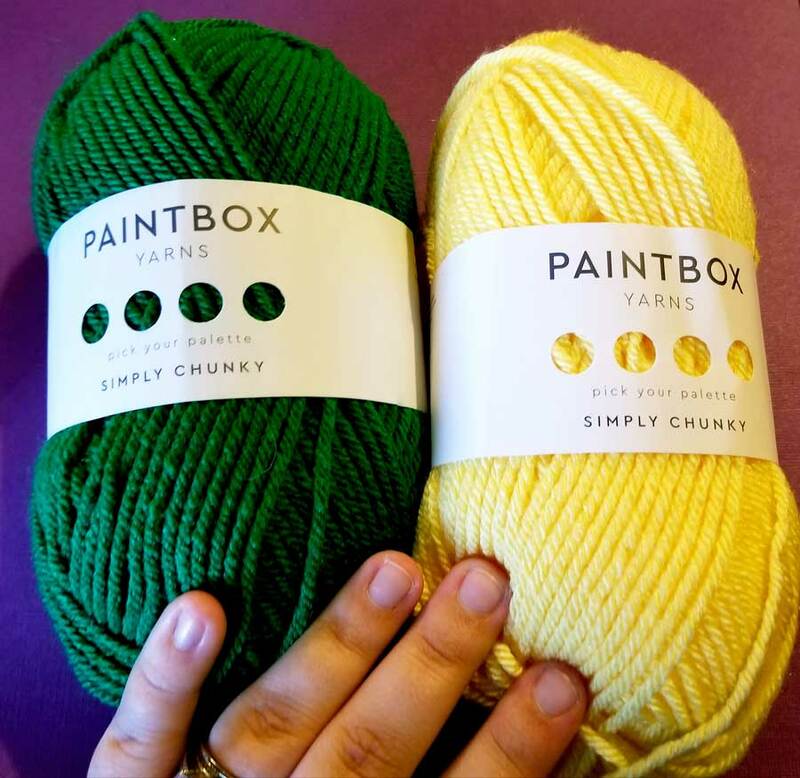 · Yarn: Medium, Weight 4; Yellow and Green. 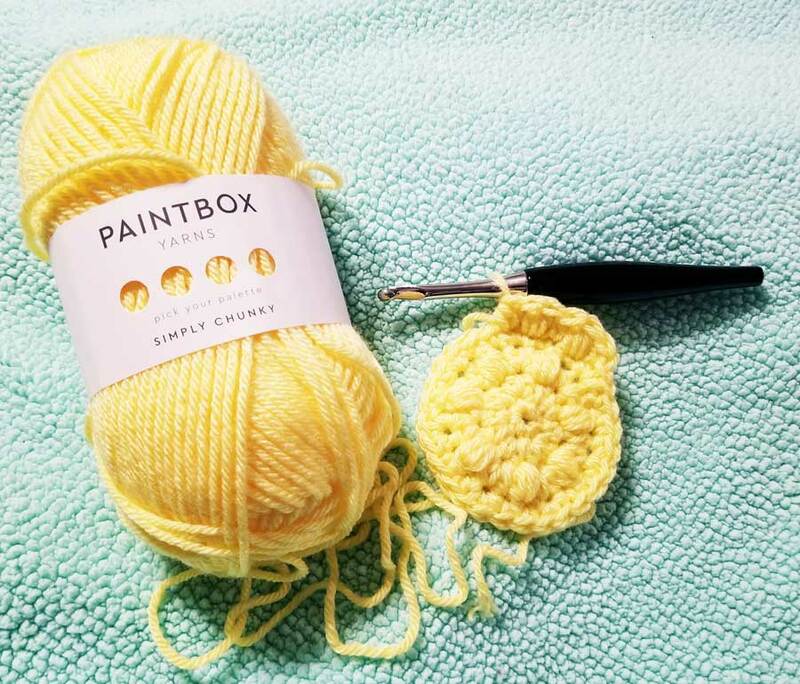 Sample is made with Paintbox Simply Chunky. · These measurements are approximated, measure head to get accurate sizing needed. · Puff Stitch: *Yarn over, insert hook into stitch, yarn over and pull up a hook; repeat from*, three times. Yarn over and pull through 6 loops on hook, yarn over and pull through last two loops. · Chain 1 will NOT count as a stitch. · Joining: When ending the rounds, you will join with a slip stitch into the 1st stitch (not the chain 1). Repeat Rounds 6 & 7 until the beanie measures 5 inches tall, then continue to brim. Note: Make 5 leaves with your H hook and 2 leaves with you K hook. Row 1: 1 sc in 2nd ch from hook, 1 hdc in next ch, 1 dc in next 3 chs, 1 hdc in next ch, 1 sc in next ch, sl st in next ch. You are now going to work on the other side of the base chain (do not turn). Row 2: Ch 1, sl st in next ch, 1 sc in next ch, 1 hdc in next ch, 1 dc in next 3 chs, 1 hdc in next ch, 1 sc in next ch, sl st in next ch. Fasten off and weave in any loose ends, except the 10” tail. Sew the corner (approx. 5 stitches) of the 5 leaves around the center of the beanie. Then sew the additional 2 leaves into the center of the 5 leaves. You Need Your K Hook and Yellow Yarn. 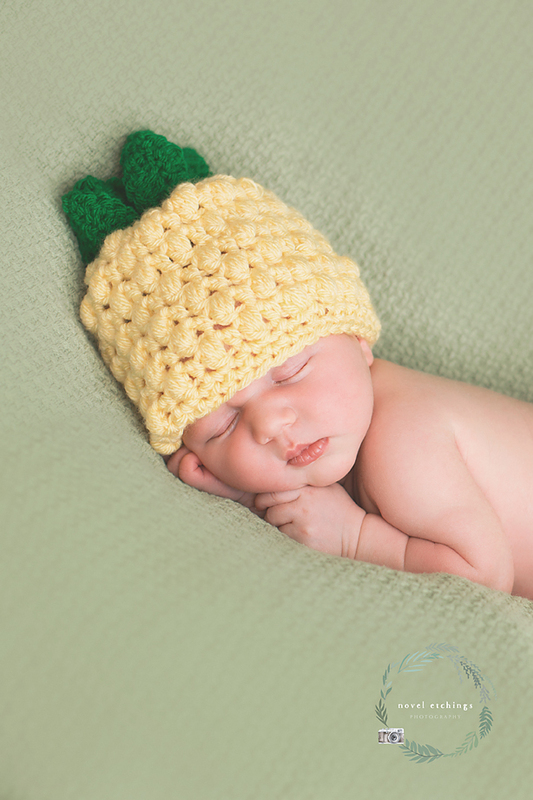 I hope you enjoyed the Pineapple Baby, there is nothing quiet like a little squishy baby in an adorable newborn prop! 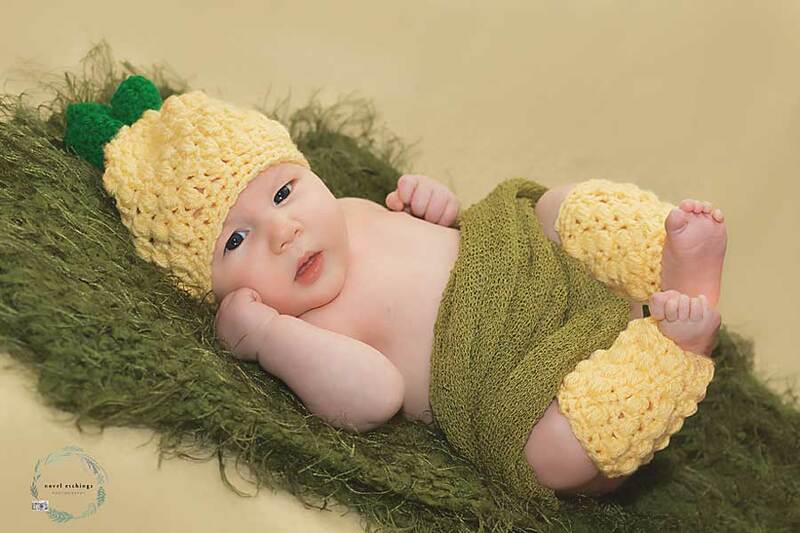 I have many other baby designs in my crochet pattern stores, plus a large variety of other designs, like hats, blankets, socks, accessories and more! You can find me on Facebook and Instagram! You can find my patterns on my blog and in my Ravelry store.